This Series ball bearing unit is a double sealed bearing with a steel cage, set screws and is pre-housed. The double sealed bearing keeps the lubricant in and contaminants out. The steel cage that evenly spaces the balls for reduced friction, vibration and noise. The set screws enable the inner ring of the bearing to be fixed to the shaft, preventing slippage. This bearing has a solid base with two bolt holes which is easy to install and safe to replace. A mounted unit is essentially a ball bearing with a spherical outer ring (self-alignment to avoid any misalignment), the ability to lock on to the shaft, and is pre-housed. Example of possible applications include: mining, metallurgy, agriculture, chemical engineering and conveying machinery, etc the bearing has set screws that makes the inner ring of the bearing to be fixed to the shaft, preventing slippage. The bearing is sealed on both sides to keep the lubricant in and contaminants out. It has a solid base with 2 bolt holes for easy mounting, installation and safe replacement. Steel cage evenly spaces balls for reduced friction, vibration and noise. Deep groove geometry for high speeds and supporting both radial and axial loads. 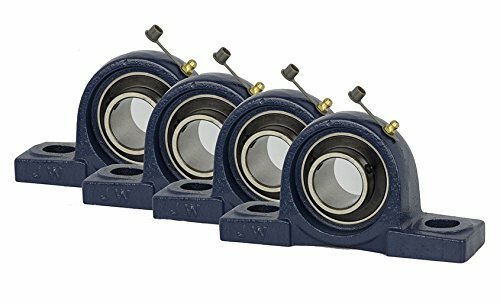 UCP205-16 pillow block bearing is also known as ami: UCP 205-16 Browning: vps-216 Dodge: p2b-sc-016 Fafnir: rasc-1 Fafnir: yas-1 Link-Belt: p3-u216n Link-Belt: p3-y216n NSK: usp205-16s NTN: ucp205-016t Peer: fhsp205-16g RHP: np-1 seal Master: np-16.